For many people who own and take care of horses, arenas are wonderful structures for providing the space they need to exercise and play with their horses. If you fit in this category, then you too may have an arena or are considering building one for yourself and your animals. When building your arena, how you design it and what materials you use can make a difference— in terms of comfort, functionality and overall experience. This is especially true for the flooring, as you want one that prevents injury on the horse and promotes performance. 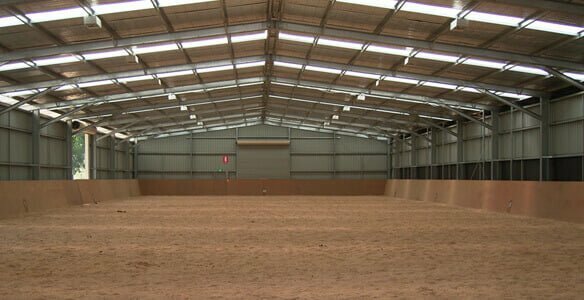 First off, it is important to realise what materials you should not use for the flooring of your horse arena. Materials that are too hard will deal damage to the horse’s hooves, causing minor damage in the short term, but potentially crippling damage in the long term. By the same token, materials that are too soft will lead to decreased performance and make maintenance on the arena more difficult. Pooling rainwater and uneven surfaces are both aesthetic and practical problems for you and your horses and can be avoided by using better materials. In general, sand is the healthy balance between everything that makes for ideal flooring. Top quality sand is best because if you are going to build an arena, you want to make the best one possible to save you trouble later. ‘Hard’ sand is preferable, so ask for that when ordering. In addition to pure-quality sand, there are certain additives that should be included in the mix. These are called geotextiles and are specifically designed to promote traction, support and consistency in performance. These mixtures can be purchased from wherever you get the sand from and although sometimes pricey, they are worth it. When building the perfect arena for you and your horses, flooring is important because poor flooring can damage the horses’ legs over time and cause unnecessary pain and vet visits. Good flooring on the other hand will increase performance and create an arena that you can be proud of and one that will serve you for many years to come. To learn more about building and designing the perfect arena for you, call us on 1300 778 628.